A cheesy, delicious, all-in-one meal. Serve with cut up fresh fruit for a tasty breakfast or brunch! 1. Arrange 1/2 the bread slices in bottom of an ungreased 13×9-inch baking dish, overlapping as needed. 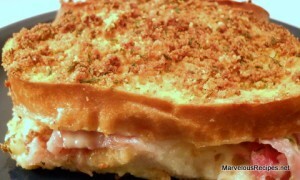 Brush with mustard; top evenly with ham and Swiss cheese, overlapping as needed. Arrange remaining bread slices over the first layer to make sandwiches. 2. In a medium bowl, beat eggs and milk with a wire whisk until well blended. Carefully pour over the sandwiches. Cover and refrigerate at least 1 hour but no more than 12 hours. 3. In a small bowl, combine Parmesan cheese, bread crumbs, parsley, salt, pepper and melted butter or margarine. Uncover casserole; sprinkle with crumb topping. 4. Bake at 375 degrees F for 30 to 35 minutes or until sandwiches are golden brown and puffed. Makes 10 servings.